Sailly is a village in the Department of the Nord approximately 3 kilometres north-west of Cambrai just to the north of the main Arras to Cambrai road (D939). 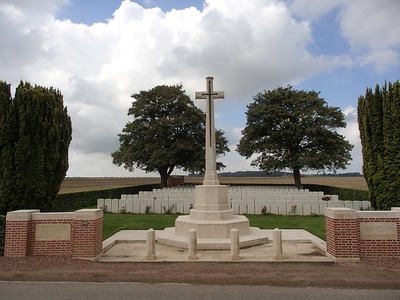 The Cemetery is signposted from the D939 at Raillencourt and is located 1 kilometre north of Sailly on the D140 on the left hand side of the road towards Sancourt. 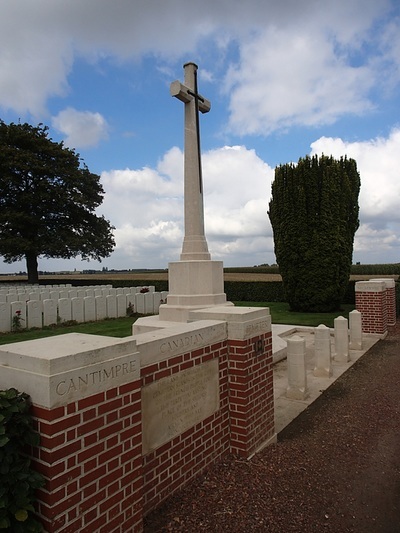 The Allied advance in the Battle of Cambrai in 1917 did not reach this district and it was not until September 1918 that the villages of Haynecourt, Sailly and Cantimpre fell into Allied hands. 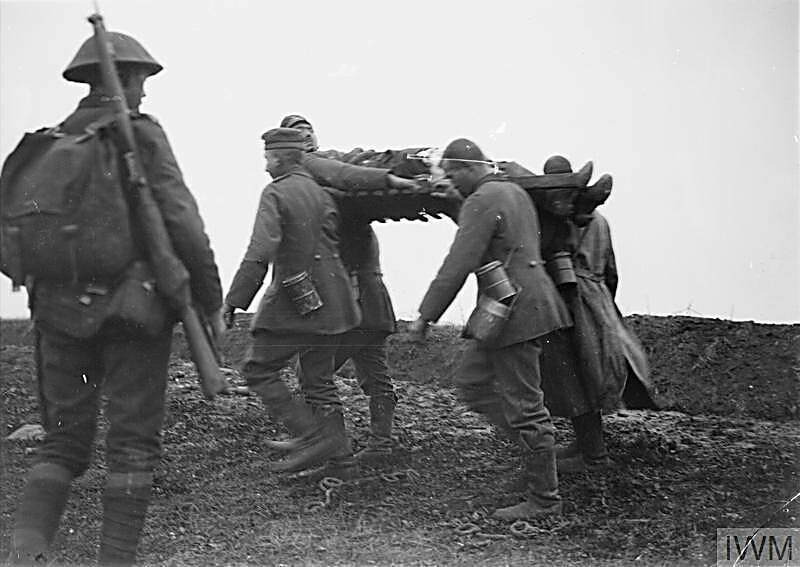 The "Marcoing Line," one of the German defence systems before Cambrai, ran from Marcoing northward through Sailly, to the west of Cantimpre and the east of Haynecourt. 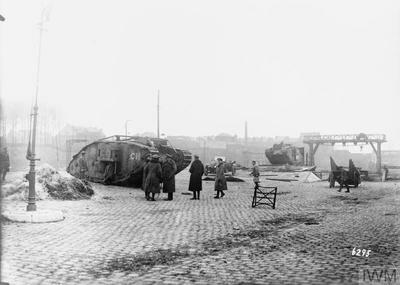 On 27 September 1918, the 1st Canadian and 11th Divisions took Haynecourt; and on the next day Sailly was taken. Two cemeteries were made by units which took part in the advance. Cantimpre Canadian Cemetery (originally called Marcoing Line British Cemetery) contains 225 First World War burials, 21 of them unidentified. 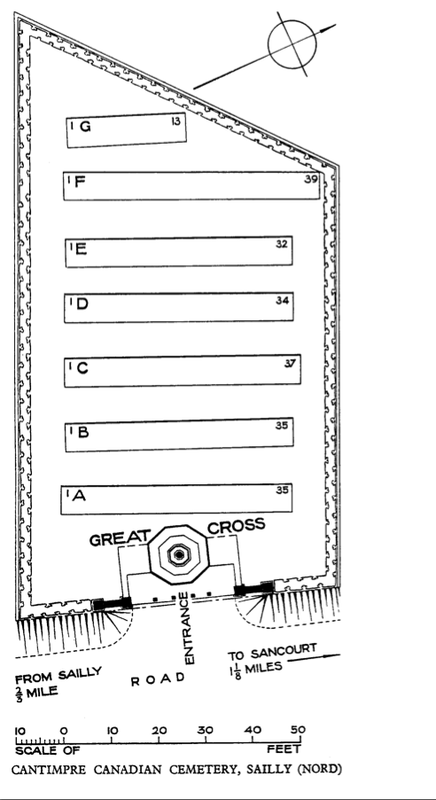 All but two of the burials are of Canadian soldiers, largely of the 54th, 75th and 87th Infantry Battalions. 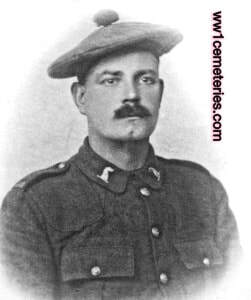 30th September 1918, aged 47. Brother of John W. Aisthorpe, of Port Hope, Ontario. Native of Port Hope. 2nd Canadian Mounted Rifles Battalion. 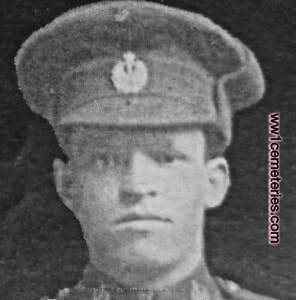 2nd October 1918, aged 22. 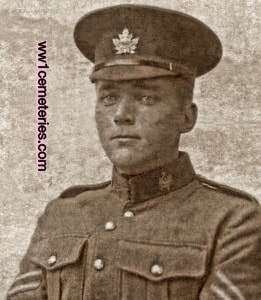 Son of Duncan and Caroline Campbell, of Lion's Head, Ontario. 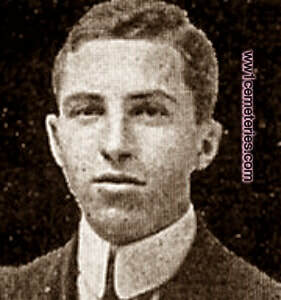 Husband of Mary E. Copeland, of Detroit, Michigan, U.S.A.
28th September 1918, aged 24. Youngest son of the Rev. Charles Darling, Rector of the Church of St. Mary Magdalene, Toronto, and of Mrs. Darling. Previously wounded at Vimy Ridge, 10th April, 1917. 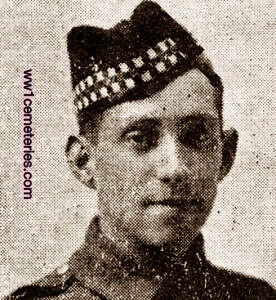 30th September 1918, aged 19. 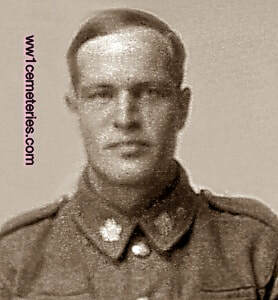 Son of Zenon Dextras, of 1264, New March St., Verdun, Montreal. 29th September 1918, aged 26. Son of Mr. J. G. Douse, of Lefroy, Ontario. Brother of Henry Christopher Douse (see entry below.) 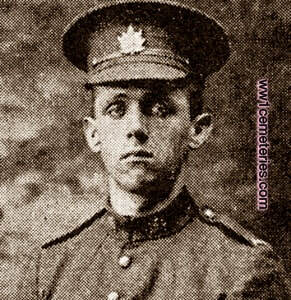 Another brother, John Harrison Douse was also killed and is commemorated on the Canadian (Vimy) Memorial. Son of Mr. J. G. Douse, of Lefroy, Ontario. Brother of Gordon Douse (see entry above.) 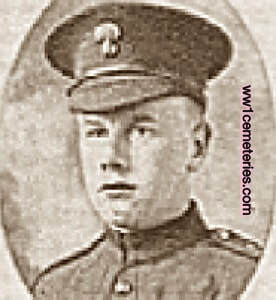 Another brother, John Harrison Douse was also killed and is commemorated on the Canadian (Vimy) Memorial. 30th September 198, aged 32. Son of Albert Arthur and Jane Lyon, of 713, Langside St., Winnipeg, Manitoba. Born at Richmond, Ontario. 30th September 1918, aged 25. 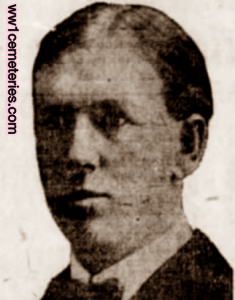 Son of James Viges, of Preston, Ontario. 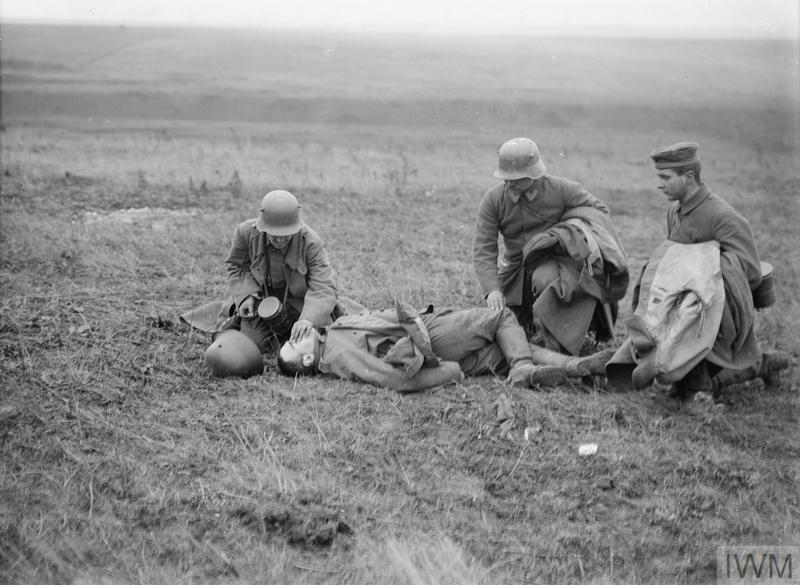 Cambrai area, November 1917: German prisoners tending to their dead comrade.